The following sightings were recorded today at Mid tide from the reserve at Castle Espie. They have returned! 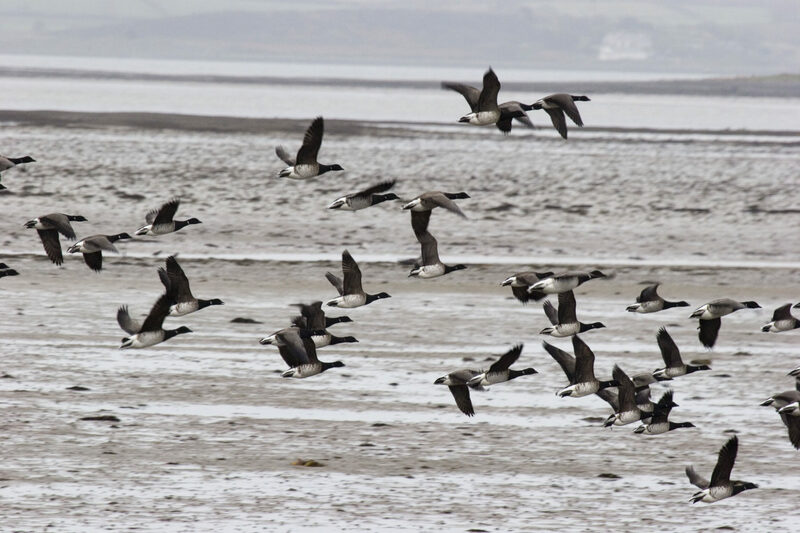 After flying over 2500 miles from their breeding grounds in Arctic Canada Brent Geese have returned to their wintering ground in Strangford Lough. First seen on the 30th August, still only small groups being seen but in the next week, thousands more will arrive. Autumn is well and truly upon us. Other waders are increasing in numbers too: Curlew are appearing in greater numbers, Whimbrel, Ringed plover and Dunlin are all being seen in small flocks in addition to the small flocks of other wintering waterfowl. Take sometime at the Brent hide and the Limekiln observatory to look over the Estuary to see some of these wonderful birds. LIght-bellied Brent Geese over Strangford Lough.